So I thought since I’ve been super busy and haven’t been cooking any extravagant meals (aside from a vegetarian chili which I would not classify as “extravagant”) these past two weeks, that I would update you all on some new products, food and a restaurant I have tried and loved. 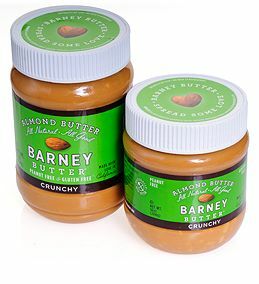 1.Barney Almond Butter (crunchy- of course! ): Seriously addictive!! My mom introduced me to this brand (I usually buy either Whole Foods or Trader Joe’s brand) and within probably a week, the jar was practically empty. The almond butters I have used in the past tended to be more oily (the oil separated from the actual nut paste) and did not always have the smoothest texture. This almond butter was super easy to spread and had a delightful, but not too rich flavor. 2.Yasso Frozen Greek Yogurt: Tasty treat that can be a great dessert or snack substitute. The fact that they use greek yogurt instead of regular “fro-yo” peaked my interest, so I had to try them. They are fruity and light and come in some great flavors (blueberry, raspberry, strawberry). Not only do they taste great, but they are also fat-free, low in sugar and have 6g protein. Definitely worth a try! 3.Spectrum Ground Flaxseed with Mixed Berries: Great addition to my morning smoothie! It honestly is not different from my usual omega-3 packed ground flaxseed, other than the mixed berries (small pieces throughout the bag), but I love dried fruit, so for me it was a win win. 4.Firebox: I had the most amazing celebratory meal here with my mother after my DTR exam. I am very adamant on splitting things with whoever I go out with so that we both are able to try everything. We ordered off of a limited menu and literally scraped our plates clean. Over the course of the night we shared potato leek soup with chive oil (rich and smooth), mixed greens salad with feta, marcona almonds, pomegranate and a light vinaigrette (perfect combination of flavors), braised lamb with brussels sprouts and baby carrots(clearly it was my one meat day), fluke with broccoli rabe, caulifower puree and a piquillo pepper vinaigrette (perfectly done, falvorful and delicioso!). For dessert they served a walnut tart with maple ice cream and a white chocolate bread pudding with blueberry puree…to. die. for. Needless to say the food was enough to carry the place, but the ambience was relaxing and the exposed brick walls gave the restaurant an interesting and chic feel. 5.White Chocolate Macadamia Nut Cupcake from A Little Something Bakery: This particular flavor for some reason, well other than the fact that it sounds amazing, was so incredibly satisfying when I had a raging sweet tooth about a week ago. The cake portion was not too sweet, moist and had macadamia nut pieces in it (love!) and the white chocolate frosting was lush and out of this world. It may not be there for very much longer, so if you are in the area, I would head over ASAP!